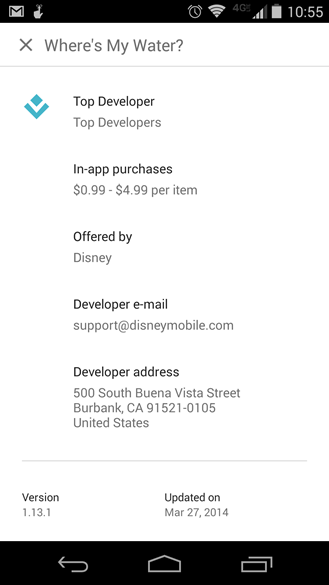 The other half of Google's Play Store policy changes looks to be going into effect alongside the new in-app purchase price ranges. Developers who have added their addresses to the dev console will now see them posted on the public Play Store page for all to see. This bit of info is in the expanded information section with the changelog and IAP prices. It's currently only showing up in the Android client, but the web store probably won't be far behind. This is the change that was met with a great deal of displeasure by indie devs who work from home. Since their business address is their home, it's all a little bit creepy. The business address has always been available in Google Wallet to anyone who did business with a developer, but posting it publicly on the listing is much different. It could open developers up to harassment or the easy scraping of personal information. 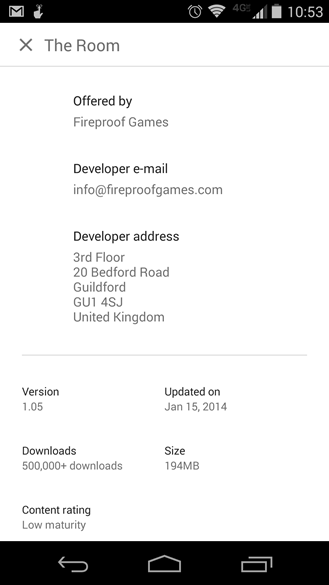 The examples we've posted above are from companies, not indie devs, but there are developers who currently have their home addresses on the Play Store. Note, this only applies to devs selling paid apps or offering in-app purchases. So what about getting a PO box of some sort? It's not clear yet if Google will accept that. The speculation is that Google has made this change to comply with new European consumer protection laws, and that could require listing the business' physical location as opposed to a mailbox. If Google is willing to accept a PO box address, that's probably the best option for a developer who doesn't have office space. It's an added expense, but Google doesn't seem likely to reverse course on this. Developers have 30 days to add an address before Google takes action. Update: Looks like the feature has gone live on the web Play Store too.